Calling all photographers and photography enthusiasts! The most awaited annual event for Canon DSLR, point-and-shoot and camcorder users, the Canon PhotoMarathon Philippines, is back and it’s even bigger! This one-of-a-kind on-the-spot photo contest that challenges the skills and creativity of participants in creating theme-inspired photographs under time pressure. These photography enthusiasts come from all walks of life and from different age groups. Participants get to compete with each other under strict contest rules and deadlines. In previous years, the Canon Photomarathon went to different cities around the Philippines. Last year proved to be the biggest yet as it went to Cagayan de Oro (Mindanao), Bohol (Visayas), Legazpi (South Luzon), Vigan (North Luzon) culminating in Pasay for the National Canon Photomarathon. It gathered around photographers from across the country and brags to be the biggest Photomarathon in South East Asia. It also won an Anvil Award of Merit for expanding into the largest camera and photography competition in the country with an increased number of participants and nationwide scope, thus helping set a new standard in customer-targeted programs. 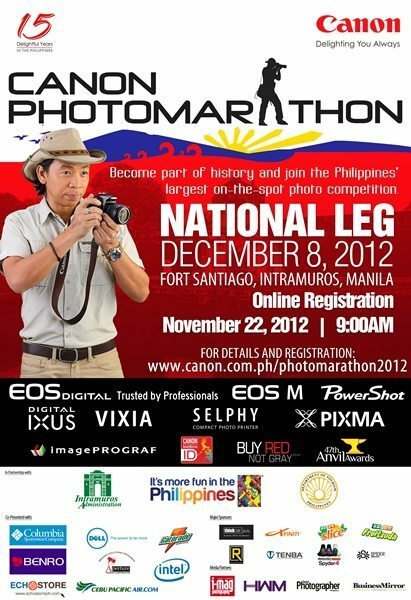 This year’s Canon Photomarathon National leg will be on December 8, 2012 and will be held at Fort Santiago, Intramuros, Manila. To join the competition, you have to pre-register online at www8.canon.com.ph/PhotoMarathon2012 starting November 22, 2012 (Thursday) (9:00AM).